Check out the Disneyland Hours July 2019. 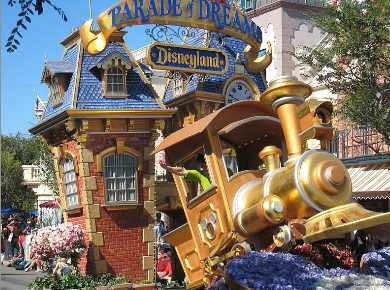 Summer is beautiful in southern California, so it is a great time to visit Disneyland California. Disneyland summer hours are long to accommodate the summer crowds. Those southern California residents who hold annual passes will find they can’t be used during the entire month of July. Disneyland summer hours means both Disneyland Park and its next door park California Adventure stay open long hours on most days. Arrive early to avoid the crowds, especially on weekends. We suggest you arrive an hour early to allow plenty of time for parking and to purchase your ticket at the gate. If you already have your ticket, arrive at least 30 minutes early to park and take the tram to the main entrance. Sunset is around 8:00 PM in July so the long Disneyland summer hours mean the outdoor attractions can stay open longer from May through August. This year Independence Day is Thursday July 4 2019. During July, based on prior year hours, Disneyland will open at 8 AM or 9 AM and close at midnight, and California Adventure will open at 8 AM or 9 AM and close at 10 PM. The early morning admission hours are also included in the table below. *If you have a Disneyland ticket with early admission privilege, the early admission hours of operation for Disneyland (DL) or California Adventure (CA) theme parks are one hour before regular park opening time. With the summer crowds, you won't want to miss your chance to enjoy some rides without waiting in line. **Some Disney annual passes are blacked on certain days. All passes are good unless listed here as blackout days. Disneyland passports with blackout dates include Signature (S), Deluxe (DL) SoCal (SC) and SoCal Select (SCS) annual passes.